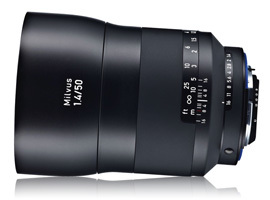 Along with an external appearance similar to the Otus line, including the all-metal barrel (complete with long focus throws and smooth coverings on the focus and aperture collars on the Nikon-mount version), the Milvus models can boast a few features not found on their more expensive Otus counterparts. All models feature weatherproof sealing, and users can use a supplied tool to “de-click” the aperture collars on the Nikon-mount models when shooting video. The Milvus model also adopt new T* lens coatings, but it’s not clear if these are similar to those already used on the Otus. 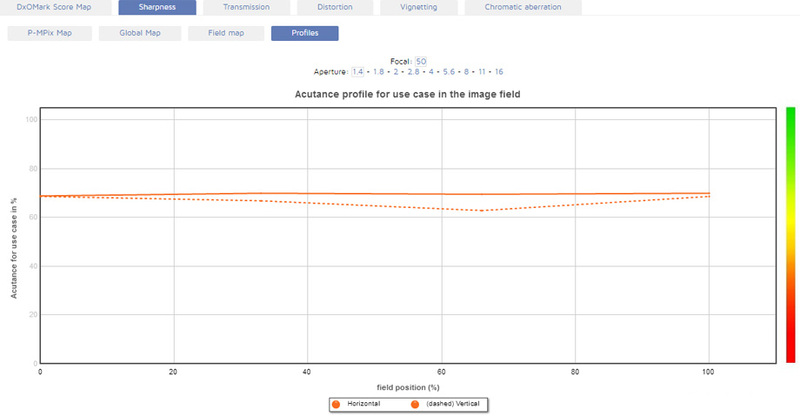 The new 1.4/50 has a complex optical construction of 10 elements in 8 groups, four of those made from anomalous partial dispersion (ED-like) glass. 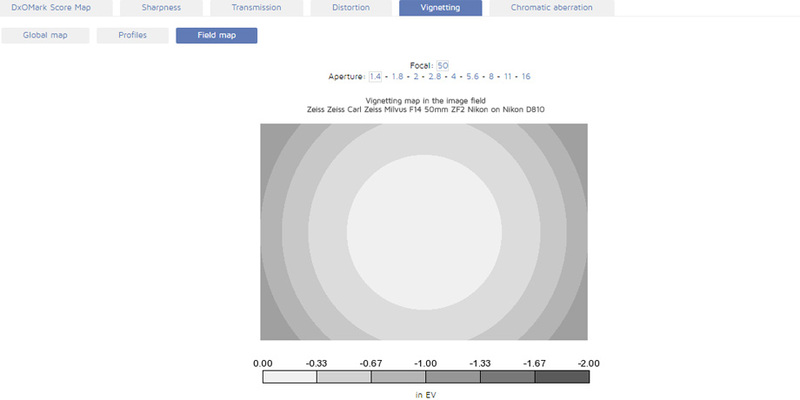 This model also has one asphere and uses what Zeiss calls “floating elements” for close-range correction of spherical aberrations. With a 67mm accessory thread, the lens is large, measuring 3.26 x 3.70” (83 x 94mm). It is also heavy and weighs 1.93 lb (875g). The new Zeiss Milvus 1.4/50 is available now at $1,199, up from around $725 for the earlier version. We’ve analyzed the lens across a range of F-mount models, including the landscape and studio photographer’s favorite, the full-frame 36-Mpix Nikon D810, and are delighted to share the results. 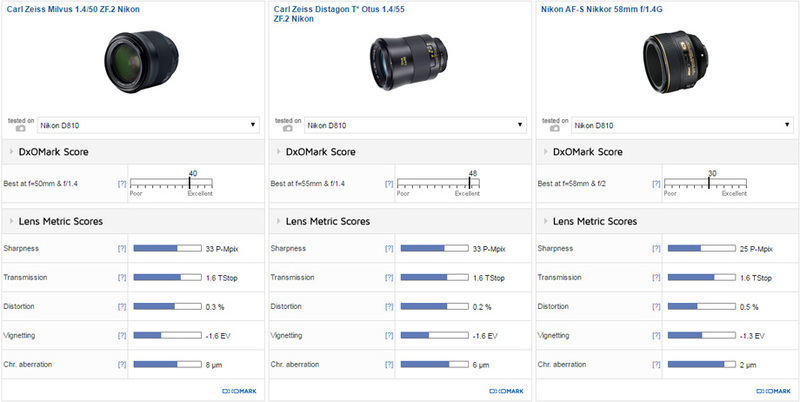 As expected, with a DxOMark score of 40 points, the new $1999 Zeiss Milvus 1.4/50M achieved a high score when tested on the Nikon D810. This is an excellent for a high-speed lens like this, for which it’s much harder to correct aberrations. It is sharp wide-open, but what’s extraordinary about this lens is its incredible uniform sharpness from corner to corner. There’s some slight astigmatism present, but it is low for a lens like this. Stopping down two stops improves sharpness levels, but does little to improve on that incredible uniformity — yes, it’s that good. Peak performance is achieved at f/5.6-8 where astigmatism is virtually eliminated and the corners literally match the center. The lens has some lateral chromatic aberration that may be visible at times in the corners, but it’s very well-corrected in the center and reduces on stopping down. 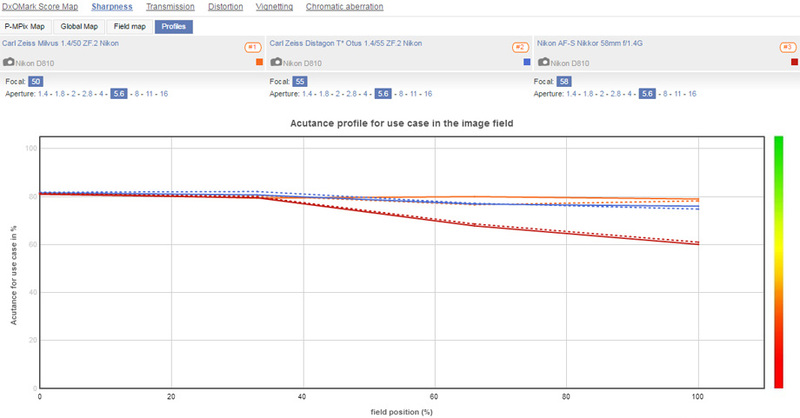 The transmission was measured as T1.6 (0.4Ev above the full aperture value), which is still good; however, distortion at 0.3% is perhaps a little higher than expected for a high-grade 50mm. Vignetting is relatively low when measured at its peak of –1.6Ev in the extreme corners, but visually it is quite noticeable. On the plus side, it is absent by f/4. In this review, we’ve compared the Milvus not against its predecessor nor the equally-worthy Sigma 50mm f1.4 Art, but rather against the maker’s $5,000 Otus model, as we felt that’s what readers wanted to see. We’ve also included the Nikon AF-S Nikkor 58mm f1.4G in this comparison. Although much-maligned, the Nikkor is designed to offer control over sharpness for aesthetic reasons. In that respect it is similar to the Milvus and the opposite of the Otus (or even the Sigma), in that while those models are optimized for sharpness at all apertures, the Nikkor and Milvus are clearly designed to offer a choice. They’re both incredibly sharp when stopped down to f/4, with the Milvus practically matching the Otus, but they’re both noticeably softer at wider apertures. The Nikkor has relatively high astigmatism wide-open, which gives it a certain character, but the sharpness and uniformity is a little disappointing and is some ways behind the Milvus. Even then, the Milvus is just mid-way between the Nikkor and the Otus, which largely explains the extreme performance (and price) of Otus. Two stops down from the initial aperture, the Milvus and Nikkor are neck-and-neck centrally, but the Nikkor still has softer borders. At f/4 and above there’s not much separating the Zeiss models — indeed, if anything, the Milvus has the edge in uniform sharpness across the field. 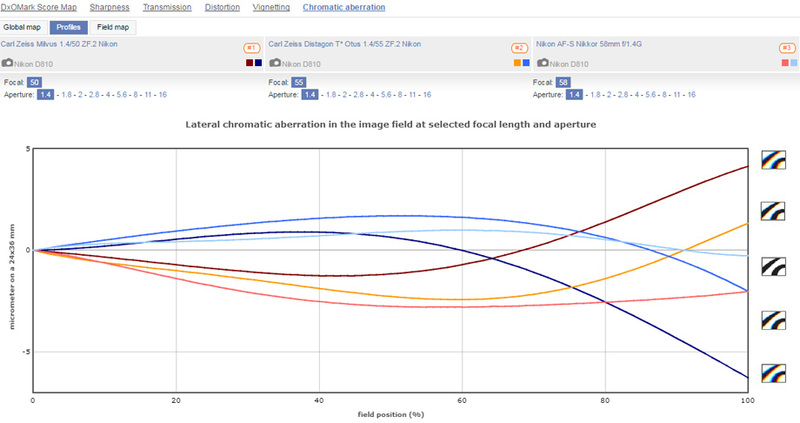 And at f/11, all three lenses are evenly matched. In other respects, the three are well-matched. The Otus has slightly lower distortion (as one might expect), and the Nikkor has lower vignetting. 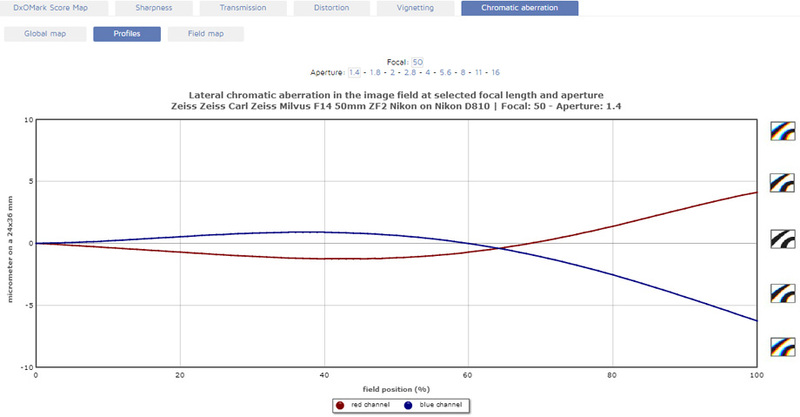 However, somewhat surprisingly, the Nikkor is also very well-corrected for lateral chromatic aberration, never peaking above 2 microns across the field. 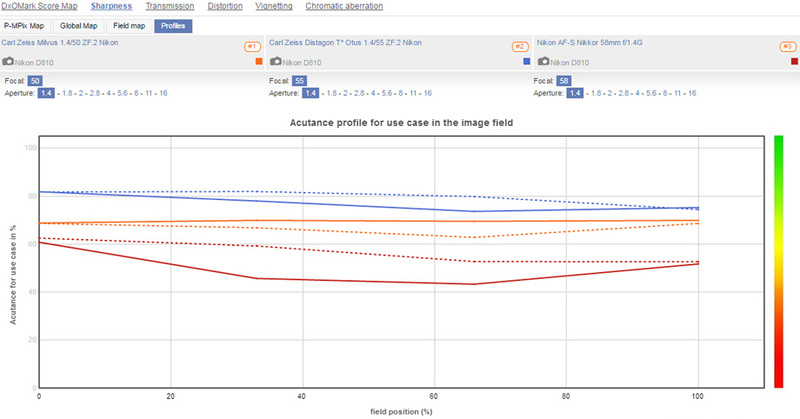 And although the Otus and Milvus appear close just looking at our metrics, in reality they have very different profiles. Even so, the Milvus has low levels of LCA, though some fringing may be noticeable in the corners at times. While it has some similarities, such as high-grade build, long focus throw, and high-quality imaging, this new high-speed 50mm Milvus isn’t designed to compete directly with its Otus equivalent. As with its predecessor, this new model is designed to offer different levels of sharpness for photographers to manipulate to their advantage. However, it is a much higher performer at full aperture, overcoming the troubling behavior of its predecessor and its rivals. It can’t match the Otus wide-open for sharpness, but it has outstanding uniformity and can deliver comparable results when stopped down — in fact, it even slightly outperforms the Otus. At a little under one-third the price of the Otus, it looks like a tempting option; however, anyone looking to buy should also consider the autofocus Sigma (not yet reviewed) at around $949 (refer to our performance data).